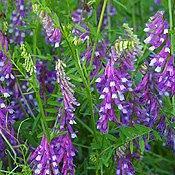 Hairy vetch is a cool season legume cover crop that is used often by vegetable gardeners. It can be planted in the fall to grow and fix nitrogen all winter. In the spring it is mowed or cut down and the vegetables are planted right into the undisturbed roots of the vetch. University research has shown that this method gives great increases in production without using fertilizer.